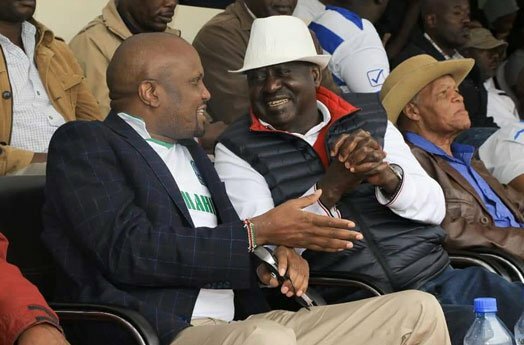 Gatundu South Member of Parliament Moses Kuria has dished out Sh2 million to Gor Mahia fans to cater for their travel expenses to Dar es Salaam for this weekend’s continental fixture. The Kenyan champions are set to face Tanzanian bigwigs Yanga in the return match of a Caf Confederation Cup tie at the National Stadium on Sunday. The announcement of Kuria’s handsome donation to K’Ogalo fans has been shared on social media by the club’s organizing secretary Judith Nyangi. HundredS of Gor Mahia fans are expected to benefit from this generous gesture by the controversial MP who attended last weekend’s Mashemeji derby featuring K’Ogalo against their eternal rivals AFC Leopards at Kasarani. During the match, which Gor won 2-1, Kuria was spotted donning the K’Ogalo jersey while seated next to the club patron Raila Odinga. Nyangi, meanwhile, has however stopped short of explaining the criteria of selecting fans who will attend the match. The 14-hour one-way bus trip from Nairobi to Dar costs Sh4,000. Besides, Tanzanian laws prohibit public service vehicle from travelling at night. Thus, the travelling fans could depart Nairobi on Saturday morning and return on Monday. Kuria joins Nairobi governor Mike Mbuvi Sonko and Senator Johnson Sakaja as the politicians who have in recent times bankrolled the travel arrangements of Gor Mahia fans. This handshake thing sud not stop……..
Great Hon Kuria and handshake is working. Kaka anene. ..Wabiro yudo gima wadwaro. This handshake. ..wacha tu. gi mahati then even 20 people wont go there. Moses Kuria for president 2022. I will not applaud this gesture for one reason that we ought to be self-sustaining, self’sufficient and self-reliant. The moment a philanthropist undertakes certain activities that could otherwise be undertaken by the club, then we should scratch our heads and ask ourselves what we ain’t doing right towards the sustainability of Project Gor Mahia. Why is project Gor Mahia never taking off? We don’t need to go far to get project models that we can learn and borrow from. Locally we have those that have been successful. Sofapaka and Kariobangi Sharks are local success stories which we can learn from. In the same breathe we can cite Shamako Babes, Nairobi City Stars and Mahakama F. C. as stories of failure which we can also from. Teddy it is good that you see the bigger picture and that was my point.